As I wrote last week, I have been reluctant to use the word “Treason” to describe the Left’s behavior in the “Washington Cesspool” and some of the state governments. 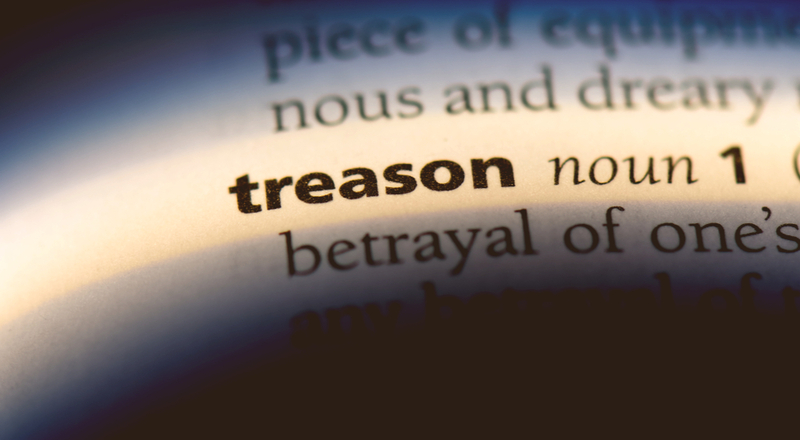 But after much thought, I am now convinced that what the Left (Democrats, RINO Republicans and the MSM) is saying and doing clearly meets the first part of the Merriam Webster definition of “Treason”. Merriam Webster definition of Treason: “the offense of attempting to overthrow the government of one’s country or of assisting its enemies in war; specifically: the act of levying war against the United States or adhering to or giving aid and comfort to its enemies by one who owes it allegiance”. When the new Congress was sworn in on January 3, 2019, a handpicked by Pelosi, hard Left, America hating, power-mad Democrat became the chairperson of every committee and sub-committee in the U.S. House of Representatives. These people apparently have unlimited power and unlimited budgets (it is not supposed to be this way in America, but it is now)! All of these people are openly using their unlimited power and an unlimited budget to accomplish the same thing. That one thing is to destroy the Trump Presidency. Over the last few days these people have also made it clear that now they will not be satisfied with destroying the Trump Presidency (“attempting to overthrow the government of one’s country”)! Now they are making it crystal clear that they are also going to destroy members of President Trump’s family and as many of his close associates and supporters as they can! It is not supposed to be this way in America! This is what happens in third world countries when one group of people forcibly takes power over another group of people and immediately takes everything of value from every member of the former ruling family, and in some instances imprisons or kills them. Jerrold Nadler, chairperson of the House Judiciary Committee made the rounds on the Sunday MSM shows to announce that his committee, “would seek documents from more than 80 people and entities as part of a probe into possible obstruction of justice and abuse of power by President Trump. Some of the entities and people he named as examples were the DOJ, Donald Trump Jr, and the CFO of the Trump organization, Allen Weisselberg. Nadler also said, “we are going to initiate investigations into abuses of power, into corruption and into obstruction of justice. It’s our job to protect the rule of law (really?). It is very clear that the president obstructed justice”. The first day of Michael Cohen’s (one of Trump’s former personal lawyers) testimony before Congress this week was a closed-door hearing before a House Committee. He was allowed to give a lengthy opening statement, that was leaked to the NY Times immediately by someone in the hearing and published by the Times while the hearing was in progress! Cohen’s second day of hearings was public and broadcast by many of the networks. I had the privilege of watching and listening to most of this hearing while working on projects in my shop. It was truly “epic”. Cohen’s lawyer is lifelong Clinton “fixer” Lanny Davis who is allegedly representing Cohen FREE! Cohen did not volunteer to testify before Congress again just before going to prison for lying to Congress under oath and income tax fraud, among other things. Lanny Davis and other “powerful Democrats”, including current committee chairs collaborated and then “invited him” to testify again before selected committees just before reporting to prison. Cohen is hoping for “reconsideration” for his pending prison sentence in exchange for his co-operating with Congress and the attorneys in the Southern District of N.Y. who are investigating President Trump’s alleged obstruction of justice. Cohen’s statements and the documents and evidence he shared with the committee could not have been put together solely by him in the short period of time between when he was asked to testify again and his testimony. He obviously had “assistance” from knowledgeable people with a lot of resources. The documents were probably prepared by Lanny Davis and an experienced team of Democrats, lawyers, and staff, and Cohen was well coached to say what they wanted him to say. Unfortunately, the results of the day of public hearing was that Cohen lied under oath again a number of times and will get more time in prison, not less. Adam Schiff, one of the most unethical partisan Democrats in the “Washington Cesspool” chaired the committee that Cohen testified before, in private the third day. When the hearing ended Schiff, Cohen and every Democrat that was on the committee was “all smiles” for the TV cameras as they proclaimed it was a very productive hearing and Cohen was coming back for an additional day of testimony behind closed doors next week. The hearings were deliberately scheduled to “compete” with President Trump’s meeting with North Korea’s dictator in Vietnam regarding the possible de-nuclearization of North Korea. This is unprecedented in American politics! What happened to the unbreakable rule that “politics stop at the water’s edge”? Jared Kushner, President Trump’s son-in-law is another member of the Trump family that the Democrats are laser-focused on destroying (he is Jewish). The Democrats, with the eager assistance of the MSM, are leaking that, “members of the intelligence community” were strongly opposed to him getting a White House security clearance. None of the “officials” have been named and none of the reasons for their opposition have been made public? Breitbart reported that “Left-wing HBO host Bill Maher mocked voters in middle America on Friday’s (Feb 22) edition of “Real Time” explaining that less “affluent and educated” people in red states are jealous of those living in more prosperous states that tend to vote Democrat”. That was just part of his disgusting monologue. If you have not seen it the entire tirade of demeaning insults against Conservatives is available on the internet. These are just a small sample of the Left’s OPEN EFFORTS to “overthrow” a Constitutionally elected President and destroy him, his family and as many of his supporters as they can while making themselves and their party invincible! However, I still believe that they are all grossly underestimating President Trump and Middle America!